Get extra features and flair with this special edition of the hugely popular Badass Overdrive. 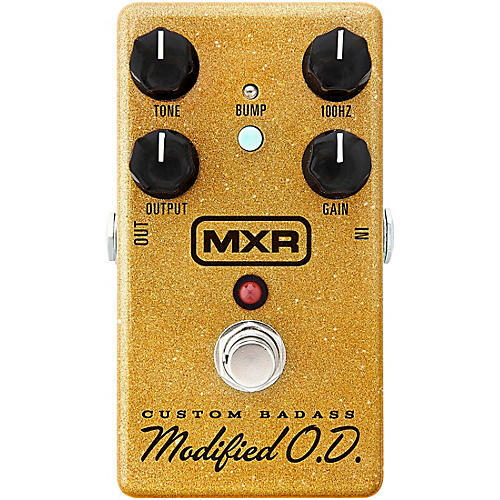 The MXR Custom Badass Modified O.D. features a classic overdrive circuit with modern modifications for improved performance and versatility. For added flexibility, MXR added a 100HZ cut and boost control that allows for a more focused EQ when cut, or a beefier tone when boosted. The Bump switch engages an alternate EQ voicing that boosts the lows and mids. Put it in front of the '78 Custom Badass Distortion for a slew of amp-like gain structures that won't mask your tone. This edition features a special custom gold sparkle finish.